June | 2011 | Beer Apprentice - Craft Beer News, Reviews, Interviews and Info. For today’s craft beer review, I want to sample a brew from the Paulaner Brauerei GmbH & Co. KG Brewery located in Munich, Germany. Being that Spring has just ended and Summer is getting in full swing, I thought it would be fun to drink a light, refreshing Paulaner Premium Pils. I have only had a few brews from Paulaner thus far and I know that they are a very old and well respected brewery, so I’m expecting a good, quality product here. Only a small description was found from the website, paulaner.com. Light, crisp taste and a traditional hoppy Pils finsish. Straight to the point. I like that. 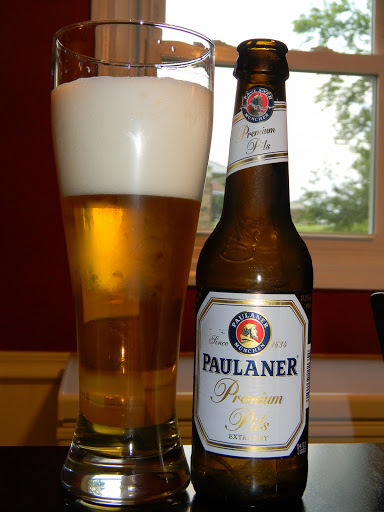 The Paulaner Premium Pils has an ABV of 4.9% and came in a 11.2 oz. bottle. The beer poured an extraordinary, crystal clear, straw yellow/light gold color. A very large, soapy, fluffy, bright white head was formed from a medium pour. Very nice retention with some ok lacing. The smell had a very distinct grain and grassy note with a light, lemon sweetness. A slight “bleached” white bread type of fragrance along with a wafer or cracker note seemed to underlay the citrus. The lemon nearly vanished as the brew warmed, which let my nose concentrate primarily on the maltiness. Smells clean with a slight hop profile. The taste brought forth more of the prominent bread and grain flavors. A crisp cracker and lemon sweetness combined with a nice hop presence helped complete a very well rounded and balanced flavor. A taste of toasted croutons became evident, which added more to the malt backbone. A reluctant bitterness wanted to join the party and would have been welcomed, however it just stayed pushed to the side for only moderate enjoyment. The taste seemed rather clean, fresh and somewhat toasty. The mouthfeel was medium, mostly dry, crisp, refreshing and thirst quenching with some snap. Only a moderate amount of flavor was left on the palate. Not bad though. It just dissipated a little quicker than what I was hoping. I thought this was a pretty good little Pils!!!! I liked the more “malt forward” aspect of it. It’s not too complex, very enjoyable and super easy to drink. It’s very suitable for the warmer months for sure. A straight forward, no-nonsense type of drink. It’s worthy of a try if you are looking for a solid, well made beer to break from the norm of the typical Summer wheat’s. Personally, I think I would rather have a good Pilsner than a Wheat or Wit on a warm day. They seem a bit more suited to my tastes. What do you guys find to be the best Pilsner on the market today? Thanks for reading and commenting!!!! For today’s craft beer review I thought I would try another brew from the exceptional Anchor Brewing Company located in San Francisco, California. I have sampled most all the products produced by Anchor, so I thought I would share with you my experience in tasting the Liberty Ale, which was the first Anchor product I ever tried. Let’s get right into the description of this brew. The website, anchorbrewing.com, had this, rather lengthy, narrative. 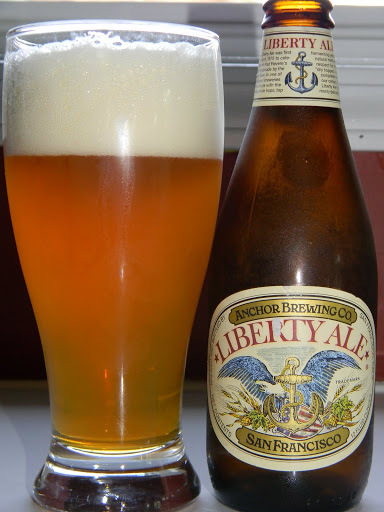 Liberty Ale is brewed strictly according to traditional brewing methods, and, like all Anchor Brewing Company products, uses only natural ingredients – water, malted barely, fresh whole hops and yeast. A special top-fermenting ale yeast is used during fermentation and is responsible for many of Liberty Ale’s subtle flavors and characteristics. Carbonation is produced by an entirely natural process called “bunging,” which produces champagne-like bubbles. Dry-hopping (adding fresh hops to the brew during again), imparts a unique aroma to the ale. It is a process rarely used in this country today. Ok…. let’s get it in a glass. The Liberty Ale has an ABV of 5.9% and comes in a 12 oz. bottle. To start with, the beer poured a cloudy, yellowish/orange color with some burnt orange highlights around the bottom. It has a soapy, white to off white head that was about 3-fingers thick. It held its shape and size for a nice, long while, however not much lacing was left behind, which I found to be a bit surprising considering the girth of the head. The smell brought out a balanced citrus aroma of grapefruit and peach along with a pleasant floral hop note. Nicely sweet with a yeast and biscuit malt background. The taste was very similar to the aroma with both the sweet, enticing grapefruit and peach notes. Clean and fresh. It wasn’t too hoppy, yet hoppy enough to produce a nice little “bite” and “pucker.” The bready/biscuit malt fits in well to give it some “roundness” and balance the profile. I didn’t find the aroma or flavor to be extremely complex, but they were both rather solid, sturdy and fitting. The mouthfeel was light and somewhat thin, but very smooth, crisp, mostly dry, refreshing and thirst quenching. Good carbonation and snap to the drink and it left enough flavor on the palate to satisfy me until the next sip. This is an very good version of an American Pale Ale in my opinion. It’s straight forward, balanced, correct and easily drinkable. It would be no problem to make a “session” out of this one. I would recommend it if you have not tried it. Don’t expect a “hop bomb”, but rather a suitable, clean, fresh hop experience. So… the next time you see it, pick up a bottle or two and enjoy it on a warm Spring or Summer day. As always, thanks for reading!!! Today’s review is of a collaboration brew produced by both the Brasserie St. Feuillien Brewery located in Le Roeulx, Belgium and the Green Flash Brewing Company situated in San Diego, California. 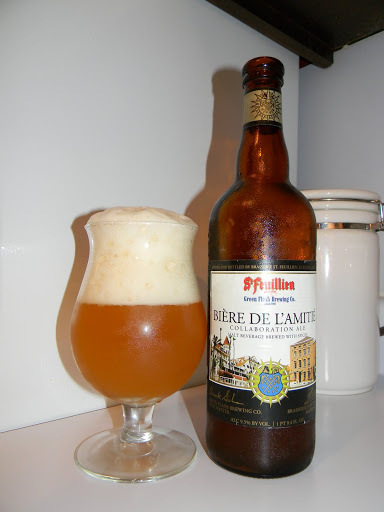 It’s called the Biere De L’Amitie and is categorized as a Belgian Strong Ale. Neither website, st-feuillien.com nor greenflashbrew.com had any information regarding this particular beer, so I had to look on ratebeer.com to find the commercial description. St. Feuillien’s centuries old brewing traditions combine with Green Flash Brewing Company’s cutting edge brewing techniques to form our first collaborative brew: Biere De L’Amitie (Friendship Brew). A blond Belgian collaboration ale, brewed with St. Feuillien’s traditional yeast and spices. For a modern twist, we add rye malt, wheat malt, and American Amarillo hops. At the crossroads of collaboration, we dry-hopped the brew for more zest. It’s old-world Belgian Abbey-style meets new-world American craft brewing – and a friendship is formed. This beer came in a 25.4 oz. bottle and had an ABV of 9.5%. This beer poured a very cloudy, yellow/gold color with a HUGE, soapy, bubbly, white to barely off white head. The cap had outstanding retention and thick “cobweb” lacing sticking to the sides of the tulip glass. As I swirled the brew, I noticed that the head became a bit more creamy looking and held to a thin layer of film on top of the liquid. This beer looked good to me!!! The smell brought out a very sweet, fresh and sour fruit citrus. Mostly along the lines of lemon with lime splashes. Peppery spices came forth in an established way and added a zing along with a definite Belgian grain/yeast profile. Only the most faint alcohol hint is detected. Earthy hop fragrances finished off the nose and completed a rather complex aroma. The taste started with bursts of a lemony sourness on the tongue followed by a yeast/grain contour. I found that the alcohol tones were more noticeable in the taste. A bitter hop bite came on strong, but settled to a light, little tingle on the swallow. As the beer started to warm a bit, the flavor changed slightly and added flavors of green banana along with crisp breads and sour dough. Although sour dough was found, the overall “sourness” from the lemon actually diminished somewhat. One final discovery was that of a dental fluoride type of zing. I don’t know for sure…. it could have just been me. The flavor seemed to be balanced ok, with lots going on, but the sourness took a little while for me to get used to. The mouthfeel was medium, somewhat sharp, crisp and refreshing. It was considerably dry with a very nice burn at the back end. Plenty of flavor was left behind, after the swallow, for contemplation. I could tell that this beer was well made and thought out, however it was just “good” to me. I think the reason being is that I don’t have a lot of experience with this style of beer, so I don’t really have much to compare it to. I found that it took me a few sips to really adjust and get into it. That being said, after I did get going, I thought it to be pleasant, very good and enjoyable. It seemed to become more malty as it warmed, which helped to take some of the “edge” off. Even with the high ABV I could see myself having this during the Spring and Summer and being quite satisfied. It was nicely refreshing and fairly easy to drink. Did any of you guys have the opportunity to try this when it came out? Please leave a comment if you wish and tell me about it.